The Nokia E71 is known for being one of Nokia’s most solid phones on the market and it caters mainly to business customers. 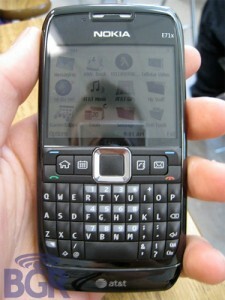 With a very sleek and metallic look, the E71 runs Symbian S60 and is currently only available at full retail unlocked in the United States. But that will all change when AT&T released it as the Nokia E71x. The cost should be around $150 with a two year contract. Now all you Nokia addicts can get your hands on the E71 at a discounted price provided that you have AT&T.